SLEEK DESIGN BAMBOO STAND FOR BAR TOOLS STORAGE » Attracting your guests attention has never been so easy :). Besides its stunning appearance, the environmentally-friendly bamboo holder solves the most annoying problems in home bars: ACCESSIBILITY, TOOLS LOSS & STEEL SCRATCHES. Its design (PATENT-PENDING) features designated dents and wood partition, making it the most thick, stable and solid bar tool holder. TOP MATERIALS: RUSTPROOF & DISHWASHER SAFE » Our superior design products undergoes restricted inspection in the U.S. Barillio 304 Stainless Steel Martini Shaker features a high-grade inner which does not leech harmful chemicals nor affect your beverages' flavors. You can dish-wash your utensils and keep their shine with ease. 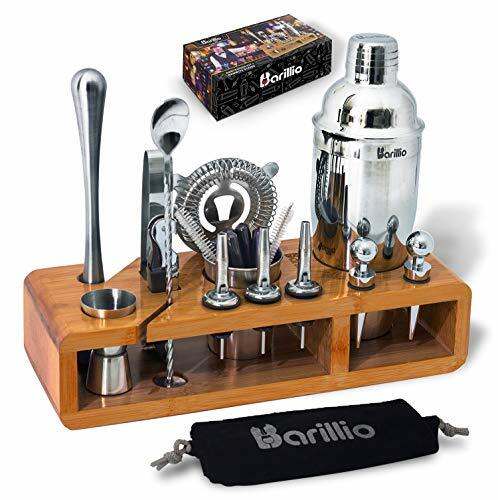 A GIFT ANYONE WOULD LOVE TO RECEIVE » Whether it's anniversary, wedding, Christmas, birthday or just an "I love you" present, Barillio bartending kit is the one you want to give your loved ones. With the super cool bamboo stand + elegant gift box + Barillio eBook "Happy Hour" (digital copy) - you're about to grant a gift your recipient will never forget! MONEY-BACK GUARANTEE » We are totally confident with our bartender set quality therefore your purchase will be backed by a 100% lifetime satisfaction guarantee. NO QUESTIONS ASKED.